The ship of Theseus, also known as Theseus’ paradox, is a thought experiment that raises the question of whether an object which has had all its components replaced remains fundamentally the same object. Plutarch asked whether a ship which was restored by replacing each and every one of its wooden parts remained the same ship. There’s a similar idea called “Washington’s Axe”, which is the story of Washington’s grandfather’s axe and how it’s handle has been replaced 14 times and it’s head about 8 times. Is it the same axe? I’ve been fascinated with the idea lately. Is the ship the “same” or is it “different”. What bearing does this have on the idea of life and self? The “axe” that is the “same” cannot be understood by looking at it in a single time slice. The “axe” of that instant does not truly represent the entire “axe”. The “axe” can only be understood as existing taking into account it’s entire temporal existence. It exists to the extent that it was bought, used for cutting, appreciated and handed down. The “axe” is not the parts, but parts made up the temporal manifestation of the process that is the axe. For ourselves, we are “fundamentally the same” in that we are part of a continuous process, our lives, which will end at some point. The process is dependent on the parts, but the parts would only be parts without the process. The philosophy of entropy takes these ideas and concludes that life is “the noble process which turns suffering into excellence”. It urges us to take action and overcome life’s tediousness by choosing to ride high on a sea of suffering, laughing at the tragic of comedy of life as a free spirited philosopher-poet. I’m unsure about that, but I do see the sense in viewing “things” as processes, and how a life of positive action is more in harmony with the realities of existence rather than indifference and surrender. 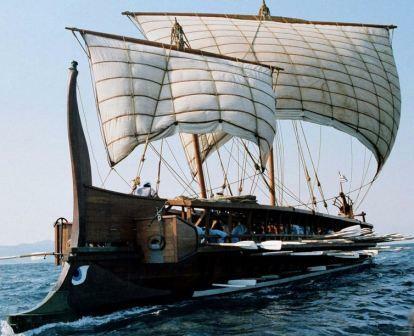 So I guess we can confidently board the “Ship of Theseus” knowing that despite it’s frequent upgrades, it essentially fulfils it’s original purpose, taking us to the place we set out to go. Tags: entropy, philosophy. Bookmark the permalink. Previous post ← What Mark Twain Learned….